Forget we ever said couch potato was a dirty word. This is the best time of year to settle in for some quality viewing, reading, or listening. Whether you’re excited about blockbuster season, geeking out about fall TV premieres, or searching for a new soundtrack, everyone has a fan in them. Hello October! Did I ever mention that I have a deep love for the month of October and fall. The air changes from warm to crisp, bright colors replace green leaves, and I grow older with each passing year. October is my birthday month and it is also my survivor anniversary month. October is about celebration, celebrating life, my friends, my family, and Halloween! Speaking of treats BirchBox once again allowed subscribers to pick a sample. I absolutely love sample choice and I eagerly waited for the email. This month I chose the Mally High Shine Liquid Lipstick in Pedal to the Metal and everything else was left up to chance. dr. Brandt – Pores no more vacuum cleaner: award-winning gel that degunks pores for fewer blackheads and smooth skin. ————————–> This product is perfect for the month of October. Why, because it plays a trick on you. When you first apply the gel it goes on opaque and when it is done working it turns a bluish hue. How cool is that? A product that actually tells you that its done. I used this the first night I got my box and it left my skin feeling so soft and smooth. Essentiel Elements – Wake Up Rosemary Shower Gel: infuses skin with nourishing honey and softening rosemary and mint oils. ————————> The body wash smells very herby and to me the scent is more suited for someone of the male variety. I will be putting this little bottle of manly smelling goodness in my gift pile. Harvey Prince – Petaly Noir: lush floral scent that evokes a midnight stroll among blossoming orchids. Mally – High Shine Liquid Lipstick in Pedal to the Metal: the ultra shiny formula acts as a lip gloss, lip primer, and line all in one. ———————————> This was my sample choice for the month of October. I full on thought that I would receive a sample sized liquid lipstick in my box. My oh my was I surprised when I lifted the lid to find the full-sized Mally in my box. The Mally is worth $20.00 which is double the value of my box. I am in love with the color of this lipstick. You can use a little or a lot, build up the color, and best of all its not sticky. ModelCo – Powerlash High impact Black Mascara: with a unique brush this Australian brand’s mascara adds length and volume to every lash. —————————-> Thanks to subscription boxes I have a never ending supply of mascara. 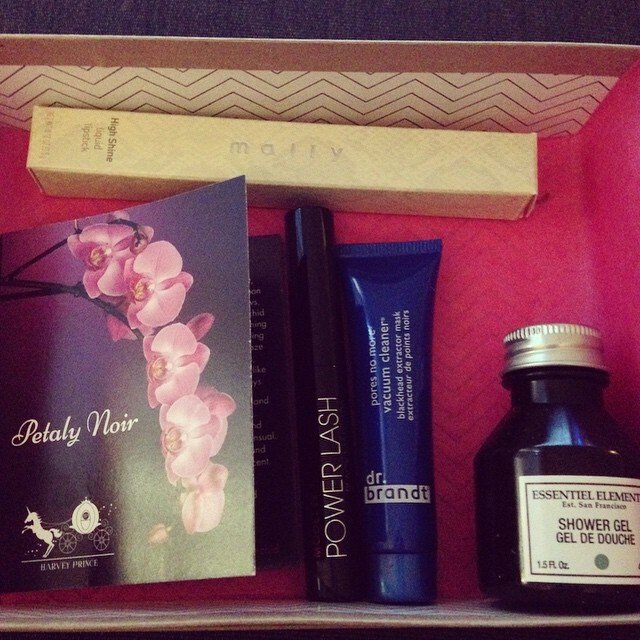 My October box was pretty darn good!